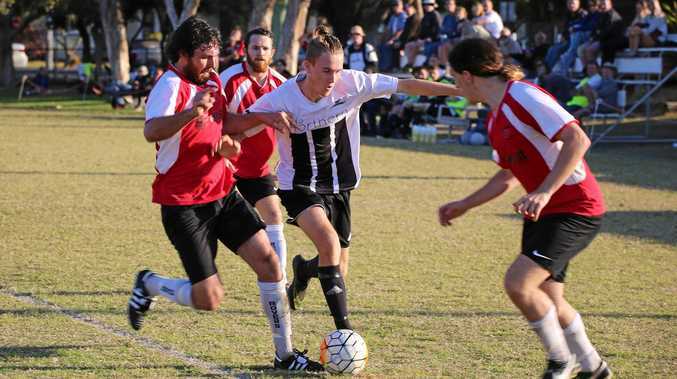 MATCHES between the Northern Hotel Rams and Richmond Rovers are always intense and fiery events, and last Saturday's prems and reserves matches at the rec ground were no exception. With two matches left in the competition and the championship pointscores on a knife edge, both clubs put everything into both games. With Yantra Whitling unavailable, many of the Rams squad pulled double shifts and endured the better part of two epic top-of-the-table battles. The reserves opened the session with a dogged and fairly even clash. Rovers showed their intent early, bagging three quick goals and putting the Rams on the back foot. Late in the first half, coach Damon Bell began to unload the Byron bench in an effort to turn things around. Substitute strikers Sam Shepherd and Aaron Walker shook up the Rovers defence with three quick goals and it was game on. Rovers took back their lead late in the match and Byron dug deep for the last few minutes and equalised with a header from James Tomlinson. The 4-4 draw leaves the reserves Rams at the top of the table with a substantial goal difference. The premiers match was an equally gritty encounter. A trademark counter attack again gave Rovers an early lead and despite Byron responding with flair, they couldn't find the net. Some spectacular shots from Joel Wood were denied by the woodwork and some equally spectacular saves from Rovers' keeper, Chris Jones. Two minutes into the second half, a free kick gave Rovers a second goal and the heat was on the competition leaders. With minutes to go, Sam Shepherd cut across goal to Emanuele Altarui, whose deft strike saved a little face for the Rams. The 2-1 loss sees the Rams go into the final round with two points up their sleeve and needing at least a draw to secure another pointscore title. Byron plays at Alstonville on Saturday with reserves at 1pm and the prems at 3pm.